If you could fly at the speed of light you could get to Canis Major in about 5,000 years, Betelgeuse in about about 600 years, or assuming you’re anywhere on earth, Camden, New Jersey in under .15 seconds. Since Elon Musk hasn’t made that technology public yet, we guess we’ll have to settle for YouTube’s ability to transmit video at nearly the speed of light. 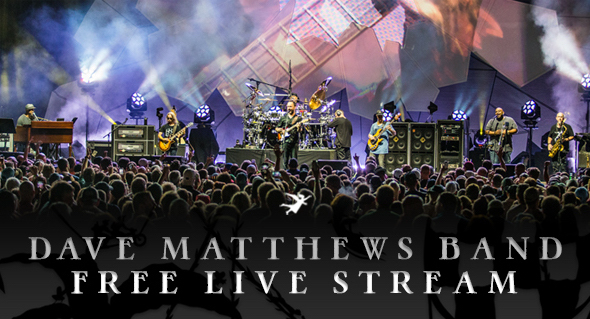 This Saturday, June 16th, Dave Matthews Band will stream their concert from BB&T Pavilion live at the newly-registered dmblivestream.com. While the band did play their last album in its entirety shortly after release on November 30, 2012, it’s never happened before or since, so we'd say the chances are slim of it happening again. However, since it’s being advertised as “Celebrating the new album Come Tomorrow," once could reasonably expect the debut of the two as-yet-unplayed songs, When I'm Weary and Come On Come On. To make things even easier, go to the livestream page now and click that little “set reminder” button to remind you of the 8pm Eastern event. The recent registration of dmblivestream.com (it was literally registered yesterday, the same day the announcement email was sent) could simply be a one-off for this album-celebrating streaming event. It could also signify the start of a larger effort by the band to get ahead of the Periscopers that are now a staple at live shows.